One of our most popular offerings! Our fully-inclusive Steelhead Package includes two (2) half days (evening and morning) of prime-time guided steelhead fishing, a comfortable night's lodging at the historic Oasis, three meals in the Oasis Cafe, and...we'll set you up with a selection of steelhead flies! 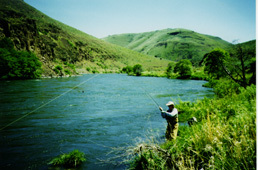 We design our Steelhead Package to maximize your opportunity to hook a Deschutes River steelhead! 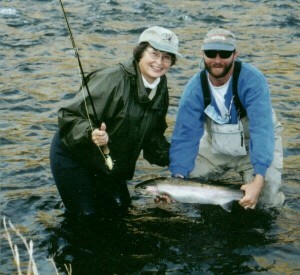 Spey fishing and casting instruction available. Arrive around noon, settle into your cabin and enjoy a delicious lunch in the Oasis Cafe. 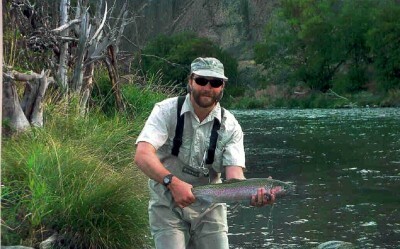 Leisurely prepare to hook up with your guide for an evening of Steelhead fishing. Return to the Oasis for a hearty dinner before retiring to your comfortable cabin. Before dawn, your guide will be ready to take you to the morning run. After a full morning of fishing, return to the Oasis for one of their signature breakfasts!